De-Wa Himalayan Singing Bowl: original, hand hammered singing bowl from Nepal, with a widened shape and a very special, long lasting sound. De-Wa Himalayan Singing bowls are used for meditation, music, relaxation, personal well-being. They are used by a wide range of professionals, including health workers, school teachers, musicians and spiritual teachers. 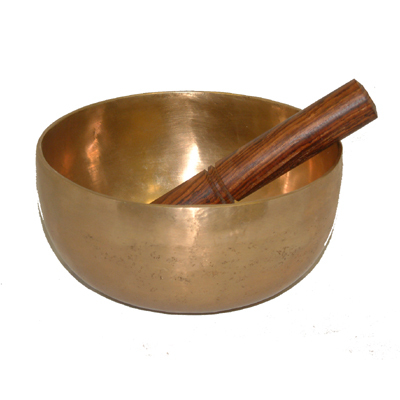 Singing bowls are used in health care by psychotherapists, massage therapists, cancer specialists, stress and meditation specialists. They are used to help treat cancer patients and also for post-traumatic stress disorder. They are popular in classrooms to help facilitate group activities and focus students' attention. Copper 71.5% / Tin 28% / Nickel 0.02% / Mercury 0.01% / Zinc 0.02% / Iron 0.02% / Lead 0.001% / Silver 0.002% / Gold 0.0001%. ">NE0262 and NE0266: Copper 71% / Tin 28.5% / Nickel 0.02% / Mercury 0.01% / Zinc 0.02% / Iron 0.02% / Lead 0.001% / Silver 0.002% / Gold 0.0001%.